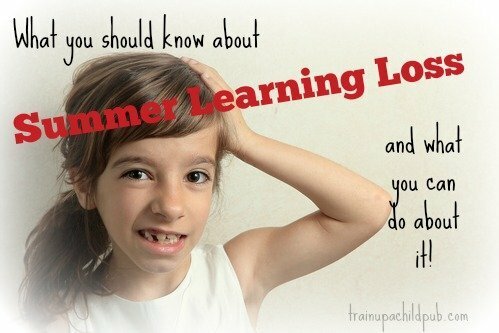 Also known as the summer slump or summer slide, summer learning loss is what your students forget between the end of one school year to the beginning of the next. Public school teachers say they have to re-teach a MONTH or more of what kids had already learned the previous year to make up for summer learning loss. Yikes! And just because we are homeschooling families, we are not immune, especially if we follow the traditional public school year and take the summer off from academics. How much learning do they lose? The biggest loss seems to be in arithmetic computation – about one to two months’ worth! Yikes! That represents a lot of work on your part as well as your students’ part, doesn’t it? If you spent hours last year quizzing one or more of your kids on addition, subtraction, multiplication or division facts, you see why it would benefit you to work a little math facts’ practice into your relaxed summer days. Second to numerical computation, reading and spelling are affected, especially for children whose parents don’t or can’t involve them in summer reading programs or other summer enrichment programs. What is really scary is researchers say this loss is cumulative, possibly putting students further and further behind as they move into middle and high school years. What can I do about summer learning loss? This summer slide is so preventable. If you school year ’round, you probably don’t have to worry about this at all, but the rest of us need to plan activities to minimize it’s effect. Of course, summer should be a time to do some relaxing, get outdoors more and have fun, but keeping your kids in learning mode to some extent is critical to keep the momentum going during extended school breaks. Surprisingly, one of the BEST things your preschoolers can do to prepare for school is PLAY. That’s right. Engaging in very active play – running in different directions, rolling on the ground, spinning, hanging upside down on a swing and just MOVING. A. LOT. is crucial to your preschooler’s development and learning readiness. It has something to do with inner ear development that takes place with these kinds of activities (they need “rapid vestibular input”) and it CUTS DOWN ON FIDGETING later when it’s time to start homeschooling. (Or any kind of schooling). In addition to lots of movement, expose your preschoolers to books by reading aloud to them daily and talking about what you are reading. Let them participate in household events such as cooking, cleaning the house, doing the laundry and making their beds. This is the time to start that habit training that Charlotte Mason talked so much about. Start getting your littles ready for school by teaching them to listen to you and be obedient right away, to take care of their own belongings, and to do tasks well. If you have pre-readers, let them work on their letters by using their bodies to form letters (and have you or a sibling guess which letter), write them in a pan of sand or in a sandbox, or build letters with blocks. Anything to add a hands on element. If your primaries are beginning readers who are solidifying their skills, now is not the time to let them lose ground! Take them (and all of your kids, actually) to the public library once a week, if at all possible, and participate in their free summer reading program that will help you track your kids’ reading (or your time reading aloud to them) and get stickers or little rewards when they reach certain milestones. Don’t insist on making them read things that are terribly challenging to them, just let them read for the joy of reading. Help your kids find books and magazines in areas they are interested – especially helpful for any reluctant reader. Spend some time in the morning when they are used to doing school or in the afternoon when it’s too hot to play outdoors to have a “reading time” when everyone quietly reads their books and look at their magazines. And just like preschoolers, primaries need to spend a certain amount of time each and every day moving. Going for a walk, swimming lessons, dancing and other active, whole-body experiences help children learn. The last comment about moving applies here as well! Actually, it applies to all of your children, no matter what the age. Reading: Have your elementary school children work up to reading 3o minutes a day. Even if what they choose is beneath their reading level, they are still building reading fluency by just putting the time in daily. Make sure you and dad are modeling reading as well – reading for pleasure and/or to learn something and talking about it will help a reluctant reader to see the value in reading. It might be as simple as standing in a circle with your kids, saying, “4+6” and then throwing a ball to someone who has to answer the question. Then the person who answers gets to come up with a problem and throw the ball to someone else. Another fun game is “Math War” with cards: Two at a time can play; divide up the cards into two piles and each person gets a pile. Each person takes her top card and flips it face up on the table at the same time. The first person to add the numbers together gets both cards. You can also subtract the smaller number from the larger, or multiply the numbers. If you have a younger and older child, one can add or subtract and the other one can multiply. To make this more challenging, you can even have another person sit alongside to call out the numerical operation that needs to be performed. Writing: Look for opportunities for your students to write. Have them write Grandma a letter. They can write instructions for taking care of a pet, or directions from your house to their best friend’s. Or have them keep a journal and write a few sentences in response to a daily prompt, or record what they did that day. Be creative and use as many ways to write with ‘a real purpose’ as you can. What about the upper grades? Learning loss becomes a little more serious as your student moves from elementary school into middle school and then into high school. Find out how to immunize your older children against summer learning loss in parts 2 and 3 of this series! So, what are you doing this summer to hedge your bets against summer learning loss? If you have a middle schooler, make sure to see Part II in this series: Summer Learning Loss for Middleschoolers. If you have a high school student, definitely read Part III to see just how important those summers are!